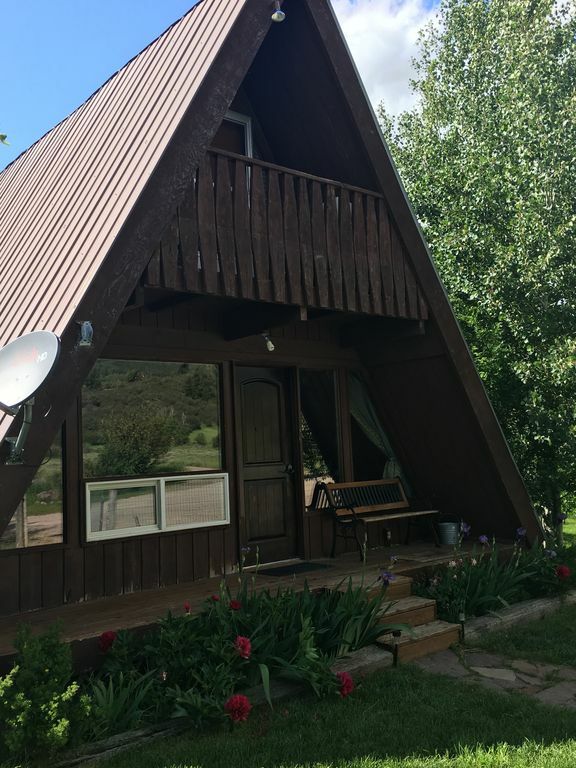 This is a very CLEAN, cozy, completely cedar, A-frame vacation cabin in a great location - just 22 miles from Jackson, Wyoming, southeast of Victor, Idaho. 8 miles to Driggs Idaho, and ZERO miles to Mountain views! We have great feedback from our guests! This vacation cabin is surrounded by the Grand Teton Mountain Range, two other mountain ranges, trees, and open space. It is close to the cities of Victor, Idaho, Jackson, Wyoming and Driggs, Idaho. Grand Teton National Park Entrance @ Moose, WY is 50 minutes away--although you enter the actual park prior to that. Yellowstone is an incredibly beautiful drive about 1.5 hours away--through GTNP and Jackson, or about 2.5 hours through West Yellowstone. Downstairs is one new queen-size bed with new memory foam topper , two nightstands and two lamps, closet, and dresser with great views out the large windows. Upstairs, there is a new QUEEN SIZED bed with memory foam topper and comfy very padded futon in the 10'X 25' foot private loft (Our guests have told us this futon is VERY comfortable and it also has a memory foam extra mattress!). The balcony and Phoenix HOT TUB are very popular with guests. New travertine tile installed in kitchen and bathroom, and dining room!. DSL internet in the home always in summer months, and other times with advance notice. Bring your computer. Dish Network satellite basic package always available. We offer nice kitchen appliances with everything you'll need to cook a meal, including some spices. Small sized Washer with drying rack for small loads of clothes. Laundry mat just a mile away for large loads. We are just one mile from celebrity-designed TETON SPRINGS GOLF AND FISHING RESORT. We are located next to a quiet shared cross country ski/pedestrian trail that goes for MILES! Enjoy the busy tourist vibe in Jackson--and relax in peace at night after a busy day! We are within two miles of MANY Targhee National Forest trailheads, creeks, and streams. From our little cabin, next to the foothills of the Teton Range, you can ski, hike, ride, snowmachine or get to the most beautiful places on planet Earth. We see wildlife during every season from this cabin - deer, elk, moose, bald eagles, etc. Two moose, 15 elk, and 20-30 deer lived in our field/adjacent pastures most of last winter. Fox and coyotes were seen traveling across from the cabin. You can fly in from Jackson or a cheaper route might be Idaho Falls, Idaho (an hour and 20 minute drive away). Salt Lake City is 4 1/2 to 5 hours away and is a pretty drive if you fly in to there. Allegiant air has good specials to Idaho Falls coming in also from certain airports. We love to help our guests enjoy their stay with us, and we can offer 'insider views' on what to experience while you are here for BOOKED guests! Clean up outside by you immediately required after your pet does his thing. :) Please keep your dogs out of our perennial flower garden. Keywords: A-Frame, Cedar, Cabin, Tetons, Victor, tourist information, home , rental, vacation, Rental vacation cabin, ski cabin, HOT TUB(summer only), budget, Tetons, hot tub, pets, family cabin, fenced yard, hiking, vacation rental, Grand Teton National Park, Yellowstone, lodging, chalet. Kendall and Janine Jolley have owned their own rentals since 1996. They have great smart kids, lots of horses, and assorted farm animals. They love the outdoors, floating the Teton River, photography, hiking, camping, fishing, riding horses, 4-H, music, and community involvement including being on local county boards / non-profit boards and volunteering with their church and scout troops. This is the Perfect spot for vacationers who don't want to stay in crowded Jackson, but want to be close enough to go visit GTNP, Yellowstone, Driggs and Victor area canyons, great skiing, hiking, fishing, etc. etc. This cabin is very clean and has lots of linens provided. This cabin is exactly what we promise--clean, cute, comfortable with beautiful views. It's a great base for your Teton vacation! My family has lived on this land since 1910. We know the culture and community. Our ancestors homesteaded this area back when it was really just the deer and the buffalo roaming. :) Native Americans lived here in the summers, but the winters were too hard, and they had winter camps they moved to every fall. My family knew personally the some of the famous explorers and Indian characters who lived here. Many of the lakes and mountains around here were named for them or my family and other homesteaders. Elk, moose, deer, bald eagles, and other assorted wild creatures come and go as they please through our land. We love it! The stars are so clearly seen--we love sitting in the hot tub at night enjoying the cool night air & gazing at the stars. It's a quick trip to Jackson from our cabin, but a world away from the noise and traffic. 1Full sized tub and shower. Travertine tile and beautiful new tile on floor . Roomy sink with mirrored shelf above sink and shelving for towels. Plenty of towels provided with lots of hooks for re-using if you choose to do so. Perfect. As I write this in December of 2014, this week so far I've seen 2 buck deer, several does, 3 bull moose, and elk above our cabin. We love being in the countryside, but close to town. Grand Teton Range (Taylor Mtn sits in front of cabin), Palisades Range, Big Hole Mountain Range all surround this cabin. HIlls, trees, open green pastures, and in the winter, cross country skiing. Cross country skiing right from cabin--downhill 22 miles away. Grand Targhee or Snowking ,Jackson Hole Mountain Resort or Kelly Canyon. The country road has been designated a 'Shared Use Cross Country Ski Path' by the State of Idaho, and our own County. Ski for miles and miles from the cabin! See a large pond across the country road from our cabin. A large landscaped pond is across the road. The walking path is adjacent to this private pond. With 2 WEEK ADVANCE notice and an extra set-up charge. Otherwise, please use your cell. We have plenty of fresh clean linens in this home. Our housekeeper is meticulous and we do our very best to keep it clean! We give you plenty of fresh towels, and linens. Two regular sized vehicles...no trailers, etc without notice . Yes. Make sure we have it turned on for your stay if it's important to you. Nice sofa and love seat. New as of 2018. Clean, and comfortable. Flat Screen TV. It's all here for you to use. Lots of dishware, kitchen supplies, even some spices. New tile in the kitchen makes clean up a breeze. Neat built in table with two benches. Comfortable for four people. Large screen TV downstairs with basic satellite package/local stations if desired. Small TV with VCR/DVD only upstairs. Upon guest request, a Basic package is available. An assortment...We love books, so let us know if this is important to you. We can share! Find them on the high shelves in the queen bedroom. Lovely lawn with lots of trees and flowers, adjacent to lovely walking/biking/cycling cross country ski path. Use completely at your own risk, with your own vehicle, and bring it back undamaged....Like the bikes, we are willing to share, but don't guarantee the kayak to be anything other than a favor from us. Use at your own risk--If you want a casual ride on our family bikes, ask and we'll see if we can loan a few out for you to take a ride....they are what they are...not fancy, but function for us! Grand Targhee, Snow King, Jackson Hole Mountain Resort, Kelly Canyon. Teton Springs offers this...or community courts in Driggs or Jackson in summer months. Teton Springs is just 2 miles away. For Summer/Fall Guests only: Large, Tons of Jets, Nice Lid Lifter. Sit in your private backyard and count the stars! We can't refund if it goes down. It's been great, and very reliable. HOT TUB in the summer/fall, Wildlife surround the nearby area, near to tourist activities, Open pasture, Mountains surround you, Propane Barbeque grill, No Smoking inside, Nice Furnishings, Cedar Interior, Original Native Artwork, Plenty of Privacy and Parking, Selected NICE Pets may be possible with an additional $50-65 fee per stay. Tourist activities, Pet friendly, Hot tub, Resort World-Class Golfing, Playground nearby, bike and walking paths, National Forest very close, hiking, horsebackriding, etc. White-Water Rafting, Alpine Slide (great fun for kids and adults in the summer/fall months), One-of-a-kind Movie theater with old-fashioned style and great sound! Jackson Recreation Center near enough for lots of fun w/ the family., small farm with horses, and a few chickens next door...Dark skies and big stars at night, quiet area near tourist activities, but just far enough away for peace.